Make your Spanish speaking customers feel comfortable at your store with Se Habla Espanol neon signs. Tell the world that you can speak Spanish and gain the attention of those Spanish language lovers to visit your shop with Se Habla Espanol neon signs. There is an immense population of Spanish people who have no knowledge of English. Make them notice your shop, restaurant, salon, or any of your business establishment with Se Habla Espanol flashing neon signs. Save your customers time and effort trying to translate in two different languages by placing your Se Habla Espanol neon sign on the outdoors or indoors of your store. Se Habla Espanol neon signs can be the best source of advertisement for your business with easy installation, cleaning and maintenance. We deliver a wide range of Se Habla Espanol neon signs in bright glowing shades of neon like green, red, blue, white, yellow, etc. Select a design Se Habla Espanol neon sign from our collection and make your business location a favored one for all those Spanish customers. Get your Se Habla Espanol neon sign customized in great designs and styles by our very talented designers. Add animation effects of to your customized Se Habla Espanol animated neon signs and grab the attention of your customers. 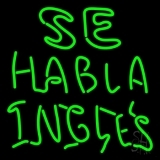 Give flashings of borders and texts and get your Se Habla Espanol flashing neon sign personalized. Place a custom Se Habla Espanol neon sign to your restaurant and draw in more Spanish customers along with your existing customers. Get your design and customized Se Habla Espanol neon sign today!